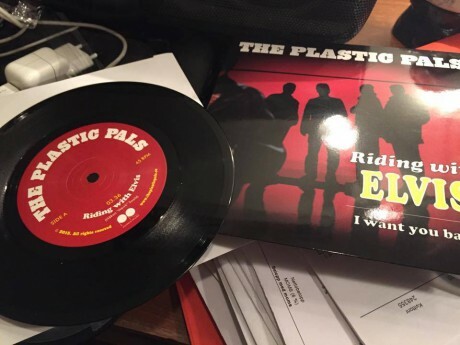 Record Store Day, Saturday April 18, we release our first 7″ vinyl – hand numbered limited edition in 200 copies: Riding with Elvis/I want you back. 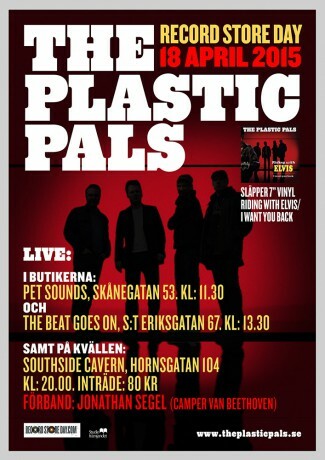 We will play two instore gigs in Stockholm: at The Beat Goes On and at Pet Sounds Records. In the evening we´re playing at Southside Cavern, with Jonathan Segel (Camper van Beethoven) as support. Jonathan will also be sitting in with us on a couple of tunes. Riding with Elvis has, as you may well know, already been released digitally via World Wide Vibe Records, NYC. However, I want you back, our first release ever of a cover song (originally released by Jackson 5), hasn´t been released before. Apart from this snippet the only way to hear this version of ours is to buy this vinyl single, that also comes with a unique download code for both songs. The vinyl single can be purchased at our Record Store Day gigs (and later gigs as well as long as the stock lasts). After Record Store Day it can also be purchased via the shops where we´re playing at on that day: The Beat Goes On and Pet Sounds, as well as via Hot Stuff Mailorder + you could alway buy it straight from us – more info on how will come soon. Posted on Sunday, April 12th, 2015 at 7:39 pm.